We can be there for our neighbours when they are most in need. Our neighbours may not live next door or on the same street or even in the same country but they are still our neighbours. Most of us know and support causes who need practical donations yet we rarely mention this because we may feel we already ask a lot from one another. Our recent Blanket Drive, working alongside NG Solidarity, was a huge success and has already made a difference in the lives of so many refugees, it was a simple appeal where we were simply passing on items we no longer needed, items that were in our cupboards and drawers. That is why I launched the When I Needed a Neighbour appeal. Sometimes you may have spare items in your cupboards or your can afford to buy an extra tin of beans for a food appeal or some toiletries for a homeless person. It’s help like this that will go on to make a big difference in the lives of others. The When I needed a Neighbour appeal is a chance to make a difference through prayer and practical donations and enable us all to be educated on causes and issues that we may not otherwise be aware of. 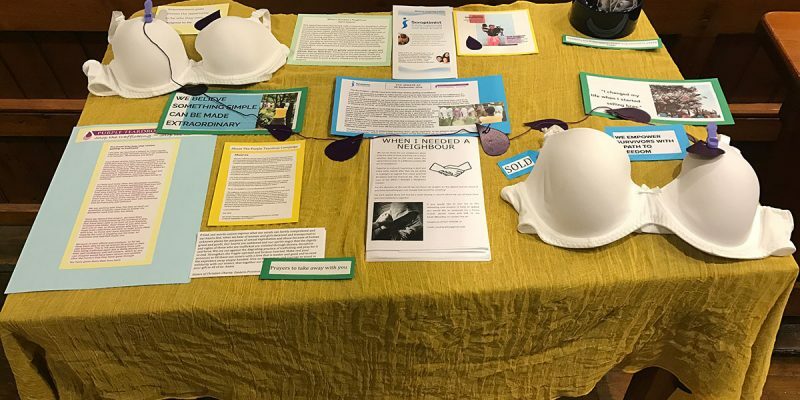 Each appeal runs for one calendar month and our first appeal began in April with a request for donations of bras on behalf of The Purple Teardrop Campaign which is a Soroptimist International initiative. The Purple Teardrop Campaign aims to promote human rights, particularly focussing on the infringement of human rights suffered by the victims of people trafficking and supports those in danger. Many women and girls fall prey to traffickers and find themselves caught up in prostitution or domestic servitude in countries such as Ethiopia, Kenya and Mauritius. All bras collected will be sent to a central collection point in Poole, Dorset, from where they will be shipped in quantity to Africa. The campaign has sponsored women so they have sewing machines which has enabled them to set up their own businesses. With the continued support of the campaign the women are able to restructure the donated bras so they can be sold locally. Hopefully this way the women become more financially independent, more empowered and save themselves from being trafficked. If you can donate, this initiative requires new or gently used bras only, in any size please, but no ‘first bras’. Please leave any donations, bagged and placed in the labelled box provided in the old vestry. If you are unable to donate you can still help by including this cause and all trafficked people in your prayers and don’t forget to have a look at our display at the back of church for more information too. So far this month over 60 bras have been donated which is an amazing amount. A new appeal will continue in June and then alternative months after that. Please keep this important mission in your prayers and keep on checking the website for updates and new appeals.